Cache se nachazi v obore Hvezda, pobliz renesancniho letohradku ve tvaru sesticipe hvezdy, postaveneho v 16. stoleti arcivevodou Ferdinandem Tyrolskym. 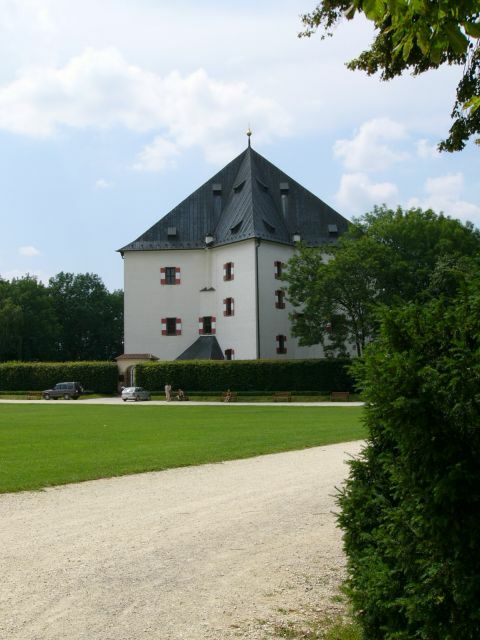 The cache is hidden in former game park of Hvezda (= Star), close to a Renaissance summer palace, which was built in 16th century by Archduke Ferdinand of Tyrol. The palace has an unique form of a six-pointed star. Letohradek Hvezda. Foto: Ponik & team, cervenec 2006. Na misto se nejsnaze dostanete tramvaji c. 1, 2, 18 (az na konecnou - Petriny); pak jeste 1250 m pesky. Nebo tramvaji c. 15, 22, 25 (zastavka Vypich); odtamtud 1600 m pesky k cachi. Po parku se da jet i na kole, ale poslednich 100 m se bez nej budete muset obejit. Teren kolem skryse je prikry, dobre se na to obujte. You can get there by tram No 1, 2, 18 (to the final stop - Petriny); then 1250 m by foot to the cache. Or by tram No 15, 22, 25 (Vypich stop); then 1600 m walk to the cache. Riding a bike is also possible, but you should leave it about 100 m from cache. The terrain around cache is steep, so put on good shoes. [cesky] Xberal iryxrub ohxh - WM fgenan. Xqlm fgbwvgr h fxelfr, wr znyvpxb avmr, nfv qrfrg qinanpg zrgeh x FI, ivqrg ilfbxl cnuly fgebzh. [English] Ebbgf bs n ovt orrpu gerr - FJ fvqr. Jura fgnaqvat ng pnpur lbh pna frr n gnyy fghzc n ovg ybjre, nobhg qbmra zrgerf gb AR.